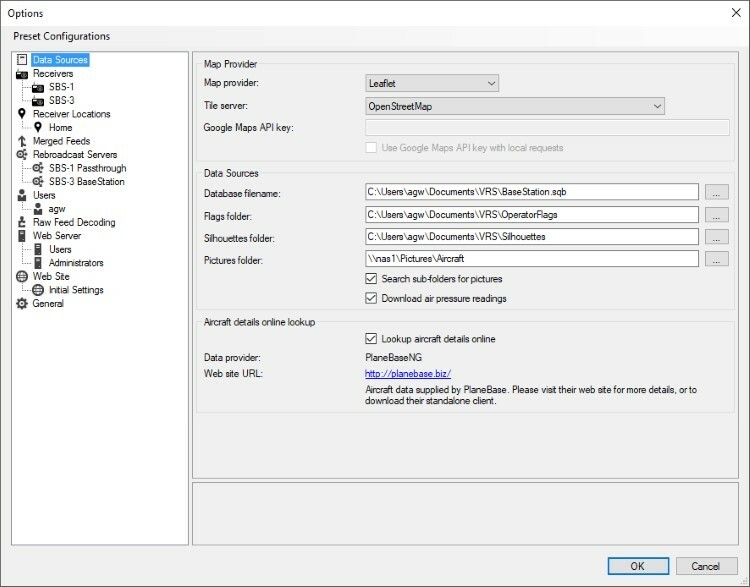 There are currently two map providers that you can choose from - Leaflet, which you can use straight away for free or Google Maps, which you will need to get an API key before you can use it. Google charge for busy map sites so using Google Maps could cost you money. If you choose to use Leaflet then you can choose which tile server you want to use with it. If you don't fill this field in then VRS will use a default tile server. The tile server determines how the map looks. Tile server settings are downloaded from the VRS web site once a day and could change over time. If you decide to run your own OpenStreetMap tile server, or you want to use a tile server that is not in the list of standard servers, then you can add your own custom server settings to this list. There is a Read Me file in the VRS configuration folder (see Help | About) that gives full instructions. Up until June 22nd 2016 Google permitted access to Google Maps without the use of an API key. However, since June 22nd you will need to register for an API key if you want to put your site up onto the Internet. You do not need to register for a Google Maps API key if you only intend to use Virtual Radar Server on your private network. It is only required for sites that are going up onto the Internet. Google have indicated that from June 11th 2018 they will no longer support requests that do not have an API key. They also insist on credit card details being lodged with them when acquiring an API key. At time of writing it is unclear as to whether you can still use Google Maps on a local network without registering for a key. Instructions on how to obtain an API key can be found here. They might be out-of-date. This is the full path to the SQLite database that either BaseStation or the Database Writer Plugin updates with information about the aircraft that it sees. You may leave this field blank but if you do then the reports will be empty and information that is not transmitted by the aircraft (such as the registration, the type of aircraft, the operator of the aircraft and so on) will not be displayed. This is the full path to the directory that contains aircraft operator logo images. You can leave this blank but if you do then operator logos will not be displayed. VRS looks in this folder for a BMP file whose name corresponds with the OperatorFlag field from the BaseStation database record for an aircraft. OperatorFlag is usually filled with the ICAO operator code by programs such as SBSPopulate. This is the full path to the directory that contains aircraft type silhouette images. You can leave this blank but if you do then silhouettes will not be displayed. VRS looks in this folder for a BMP file whose name corresponds with the ICAOTypeCode field from the BaseStation database record for an aircraft. This is usually filled with the ICAO8643 code by programs such as SBSPopulate. This is the full path to the directory that contains airplane pictures. You can leave this blank but if you do then aircraft pictures will not be displayed. VRS looks in this folder for files of type JPG, JPEG, PNG, GIF or BMP whose name is either the aircraft's ICAO identifier or registration (the ICAO takes precedence over the registration). The registration comes from the Registration field in the BaseStation database and the ICAO24 code comes from the message transmitted by the aircraft. If this is ticked then VRS will look for aircraft pictures in the Pictures folder and all folders underneath it, otherwise it will just look in Pictures folder. If this is ticked then VRS will download the current air pressure readings for airports around the world every half an hour. Aircraft usually transmit a barometric altitude; the air pressure reading for the airport closest to the aircraft is used to calculate the aircraft's likely geometric altitude. Aircraft fitted with ADS-B version 2 transponders are capable of transmitting the air pressure reading that they're currently using - when Virtual Radar Server detects these transmissions it always uses the aircraft's air pressure reading, it does not use the downloaded air pressure reading. If you have configured a BaseStation.sqb then that is consulted for details about the aircraft, if the database has details then the lookup is not performed. The entity that has provided the aircraft lookup data for Virtual Radar Server. The home page of the entity that has provider the aircraft lookup data for Virtual Radar Server.